Catching Up With… is a new series wherby I ask 21 questions to figures from music, theatre, TV and film. First up is Galway based Clare musician Daithí Ó Drónaí. MERE MONTHS AWAY from the release of In Flight, his eagerly awaited début album, 24-year-old musician Daithí Ó Drónaí is busy putting the promotional wheels in motion for a record that he has laboured over for three years. However, a busy schedule hasn’t stopped the Clare man from particing in this year’s Trócaire Live gig at The Grand Social and supporting a charity close to his heart. “The line- up, this year, is really great. Trócaire ran the line up by us before we committed and we were just really impressed with the diversity of the performers. I’m just really happy to be doing it and with the type of music that’s featured for the gig, Trócaire Live seems to be going for a real good fun night: a really light- hearted night. It needs to be a celebration of Trócaire. Finishing my first album, which I’ve been working on for about three years. When I started playing in bands in boarding school. Any time I wasn’t studying, I was playing bass in bands. It seemed something that was so enjoyable and required little effort. I have a really strong group of friends that have been with me for a while who hang around after shows. We play late, so we’re never home early! Totally Enormous Extinct Dinosaurs (Orlando Higginbottom). He’s got a great ethos. He doesn’t define himself by genre: he just wants to make people dance., which he’s been doing for years. That’s the way I want to go: to create dance music for dance music’s sake and not get hung up on sub genres or where it should be at any given time. Digital downloads for the moment, but I’ve just recently started to collect vinyl. All my favourite stuff is on vinyl, it’s fast, I can get to it immediately. What is your favourite record shop in the world? Bell, Book and Candle, Galway. It’s local and the people in there are so unbelievably enthusiastic about music. Name one rare record you don’t own, but you want more than anything. Prosumer’s remix of Murat Tepli’s ‘Forever’. I think they only printed a couple of hundred copies on vinyl. I’d love to own that one. Anything from that first studio that Daft Punk had in Paris. It was such a special time in dance music or anything from Studio 54. What is the one thing in your life that you couldn’t go without on a daily basis? I live out of my laptop. I freak out if I’m not near the laptop at any given time: I carry it every where with me. I create all my music out of the one laptop and everything that I have on the laptop is backed up by about four or five hard drives, so if I didn’t have my laptop I’d have nervous chills and I’d freak out! Overrated: True Blood. I never got that show at all! Underrated: Oz. It’s up there with The Wire. Wow…we’ll get Matt Damon to star as me and Woody Allen to direct. Who wouldn’t want to see Woody Allen making a music film? He’d romanticise it all. Playing video games until very early in the morning and nothing else. There’s a scene of people in Galway having nights out where nights out wouldn’t be the norm, which is great. Places outside the city limits like Innisheer. Galway’s always had great nights out in some form or another. I grew up in Ballyvaughan, Clare. Best things? The scenery, which I never appreciated when I was younger: absolutely beautiful. The worst thing? If you want to go to anyone’s house, you have to drive like 15 minutes! So you’re social life is built around the internet. Getting to a point where I wouldn’t be able to create anything. Who is the person in your life without whom your life wouldn’t be the same? Definitely my mam. When I was growing up, she shaped me as a person. My whole family have an ethos of never giving up. It’s developed as constantly upgrading. When it comes to live shows or recording, I never allow myself to enjoy the level I’m on; I’m always trying to upgrade to the next level. Do what you love. I see way too many people my own age getting stuck in jobs that they do for money. Never get complacent do what it is you really want to do. Otherwise, you’ll regret it. Ahead of her first Irish tour, during which she performs as part of a duo, Mama Kin- that’s Danielle Caruana to her Mum & Dad- spoke to Philip Cummins about the importance of the great outdoors to her writing process, incorporating her colourful family history into her songs and her curiosity about Irish folk music and storytelling. The Magician’s Daughter: Mama Kin, aka Danielle Caruana. GROWING UP as she did in a family full of natural performers- musicians and magicians, no less- Mama Kin (Danienlle Caruana) couldn’t help but join the family business. On ‘The Magician’s Daughter’, her fourth record, the Australian singer- songwriter has made a lush, warm- sounding, summer record full of layers of musical arrangements. PC: The Magician’s Daughter is such a natural, warm- sounding album, reminiscent of the good old days of analogue tape recording. How did you achieve that sound on the record? MK: I have Jan Skubiszewski to thank for the sound of the record. He’s an incredibly cinematic person. He goes for a very broad sound that has great width and depth to it and that has so many dimensions. That’s what struck me with the sounds that he was getting early on in the process. For this record, more so than the last record, I brought in songs to the band that were raw as I didn’t want anyone to interpret them as we might, live. I wanted them to interpret them as stories for which we were painting a picture. Jan had a visual aesthetic to how he recorded; this sense of depth and width to what we wanted to achieve. What kind of records were you listening to during the writing and recording of the record? I was listening to Joan As A Policewoman and I was also listening to Laura Marling; I was trying to get that atmospheric sound that she creates. I was also listening to this great compilation record called Saturday Night Fish Fry, a compilation out of New Orleans, which I was listening to mostly for drum grooves and sounds. It’s a really old- school, New Orleans record. All the drum takes sound like loops, but there’s too many fills and too much flair for them to be loops. Between those two very broad extremes was the record that I wanted to make. I think that feel is probably coming my brother, Michael, who plays keys on the record and is a huge musical influence on me. He’s 17 years my elder so I’ve had his musical sensibilities embedded on me all of my life. He’s heavily influenced by artists like Stevie Wonder, Dr. John, Ray Charles: that’s his world of music. So I think that when we mix that sensibility with my love for artists like Gillian Welch, Aretha Franklin, Bonnie Raitt. We have the same musical language even though we’re approaching the song from different places. So making music with him is inspiring. As for the physical landscape…I’m always tapping into that sense of open space, that harsh dynamic in our country. It’s interesting though: Michael lives on the east coast, where we’re from, and I’ve lived on the west coast of Australia for about 8 years. I am very much shaped by my environment. It’s hugely important: I’m the kind of person that if I wasn’t getting my daily injections of nature that I wouldn’t be able to create anything. So there’s a sense of almost dead calm, that space that nature affords me in my life. ‘Red Wood River’, for example, was written after I’d gone on a camping trip by a river and I had all these visual ideas of being swallowed by a river; what is it to be inhaled by a river? These were all things that triggered how I write. So the relationship between nature and natural places and us as humans to be creative is so completely intrinsic that I think it could be a problem with the next generation of kids that are coming though, which is why my parental philosophy is very much embedded in minimal screen time, how are we expressing ourselves, learning to be on your own…we’re such a stimulus addicted generation. I feel myself reaching for my phone even though I don’t really need it! Seeing that relationship play out with children is frightening. You come from a long line of musicians, with four of your siblings working as professional musicians. Has it ever gotten competitive or it very much collaborative? Quite the opposite! I had a long time of not sharing my music as I didn’t think that I was good enough. My brothers were always encouraging me, asking me where I was in the development of my songs. At the first whisper that I would develop my own songs, they were proactive in helping me. In fact, when I was playing my first shows on my first tour, my brother sat in on the rehearsals on some of the songs and in the space of one rehearsal he ended up playing on 90% of the set and since then we’ve been playing together. Taking my songs to him was scary but enlivening. He breathed new life into the songs that no- one else could have breathed because of how I know him. And when you’re at home, writing and demoing new songs, do you work mostly on your own or do you work collaboratively with your husband (musician John Butler)? Sometimes, primarily when we’re co- writing. But writing for me is a very private, solo experience. And I don’t really ever want to share until I’m totally sure of what it is that I have and I think that doing that too early can be a very damaging thing. You need the shape of the song to come out before you can have someone else add there perspective to how they see it. The song has to get to a certain point of maturity before I start showing it to someone else. Are you always able to judge when the song is complete and when you are ready to share the song with other musicians? I know when to ask for feedback! As far as knowing when it’s ready? Yeah, I think I have a good sense of when it’s ready. In the song- writing process, I can feel when a section is too long or too short. Recording is harder for me, though. I had a interesting experience with ‘The Magician’s Daughter’ in that when we finished adding all the layers and getting that lushness of sound, we were getting ready to tour the first single. Before we set out to tour, my brother injured himself in a motorbike accident, so he couldn’t come out on the road. So I went on tour as part of a duo, which is how I’ll be playing these shows in Ireland. I was absolutely petrified having spent months crafting all these layers and arrangements and then having to rely on the rhythmic, bare bones of the song, on stage, during the tour. I can’t wait to that again on these Irish shows, because it proves whether or not the songs still stands on their own merit. Did you find that stripping down the songs to their bare bones limited your choices as a performer or did you find it empowering? It encouraged me to dig deeper: I had to dig deeper in terms of my singing, in terms of my playing, in terms of the delivery. It made me work more with the subtleties of the song. When you’re playing in solo or duo form, you have to create a space where people cannot resist but walk into. It’s a very different practice. I love the feeling of being on stage with a band and having that collective energy, but I also love the feeling of being on stage on my own and having to hold that energetic space and play with it between me and the audience. I’m honoured that I think that my songs work in both settings. Gillian Welch is incredible. Both she and David Rawlings are so completely present to the song. When Gillian sings a song she is so in that song that you can’t help but be there with her: there’s nowhere else that you could be. She fills the room with the presence of the song, which is why I find performing so addictive. You have an hour and a half to share your ten or twelve stories with strangers in a room and somehow, within that dynamic, you have to find a place where, all of a sudden, this thing is intimate- where songs of mine such as ‘Red Wood River’ or ‘Cherokee Boy’ connect and people see themselves in the songs. But that can only happen when you fill the room with your song; you fill that space. That’s part of the reason why the record is called ‘The Magician’s Daughter’: it’s alchemy to in this art form and to be able to do what it is I do. I love it, but I take it very seriously and you have to be able to sit in the centre. Familial relationships play a big part in your music: your brother plays in your band, the album is titled in tribute to your mother and you’ve written about your grandfather who was a professional magician in post- WW2 Malta. Some artists have caused rifts in their own families for delving their family history for creative purposes and sharing that history with an audience: has that ever been a problem for you? It was never a question. As a family we were always very musical, so everything we did was articulated and punctuated through music: there was no separation between my family and my musical life: to separate the two would be like losing a child. I can’t fathom it. Interestingly, I’m the only one in my family who writes the way I write: I’m the only storyteller in my family. On my first record, I wrote a song called bitter tears, which is about my father’s relationship with his father. It was in me to write that song: my father’s relationship with his father affected his relationship with me, so of course, I felt that I had to write that song. But, I took it to him to show it to him and get his feedback. He said “Stop, stop, stop: tell me the words.” When I read him the lyric, he was shocked and asked me if I intended to play the song in front of an audience. I told him that I did and he let it go. I played it, live, at some shows, but the next time he saw me play he specifically asked me not to perform the song. I was so shocked as I thought that I had been writing the song for him as a gift. But I understood that there was discretion there for him that there wasn’t there for me. For me, my music is my vulnerability and that’s why it’s powerful; for him vulnerability isn’t powerful: it’s the kind of thing that he avoids. It was a very interesting process. How aware are you of the storytelling telling traditions and the folk traditions in Irish music and Irish culture? Not as much as I’d like, but I did once travel across Australia with a girl from Dingle, so I get the sense of humour, the incredible importance of music, the importance of oral storytelling tradition, and this being my third time here, the time that people are willing to invest in engaging in a yarn. We meet in a lot of ways, the Australians and the Irish. There’s a strong musical connection, too: Steve Cooney has lived in Ireland for some time, now, and he’s brought something very special to the Irish music scene. Shane Howard, an Australian artist, has very strong ties with Ireland and he’s constantly travelling back and forth, and his work with Mary Black brings him over and back. There’s also the Port Fairy folk festival, which this year featured Glen Hansard and Lisa O’Neill, who I think is just great. So when I see these performers, I see what it is that I like to bring to my own shows: this dedication to the song, to the story and a dedication to deliver it fiercely. I get the same thing with Kila, so I have a great deal of respect and admiration for the culture. So what can expect from the shows on your Irish tour? There’s always been three or four territories outside of Australia that I’ve always wanted to play. I’ve chosen them specifically as I feel that they are the territories that will understand stories and get what the back story is about to a song. The Irish, I feel, have a real grittiness to their culture, to their way. And yet it’s surrounded by great wit and comedy, and I think that’s exactly what I try to do. I try to get into the dirge of the human condition and add some humour. What you can expect, I hope, is someone telling stories, being honest. I don’t take anyone coming to a show, lightly. There’s so much anyone could be doing on any night in Dublin. So for someone to choose to buy a ticket for one of my shows, I’m on the stage to repay that debt. I don’t take audience attendance lightly. I expect them to leave feeling affected. “Majestic”: Surf by Roddy Frame. …I’ve written an album about day-to-day life in London; about being 38 and wondering what you’re going to do next. 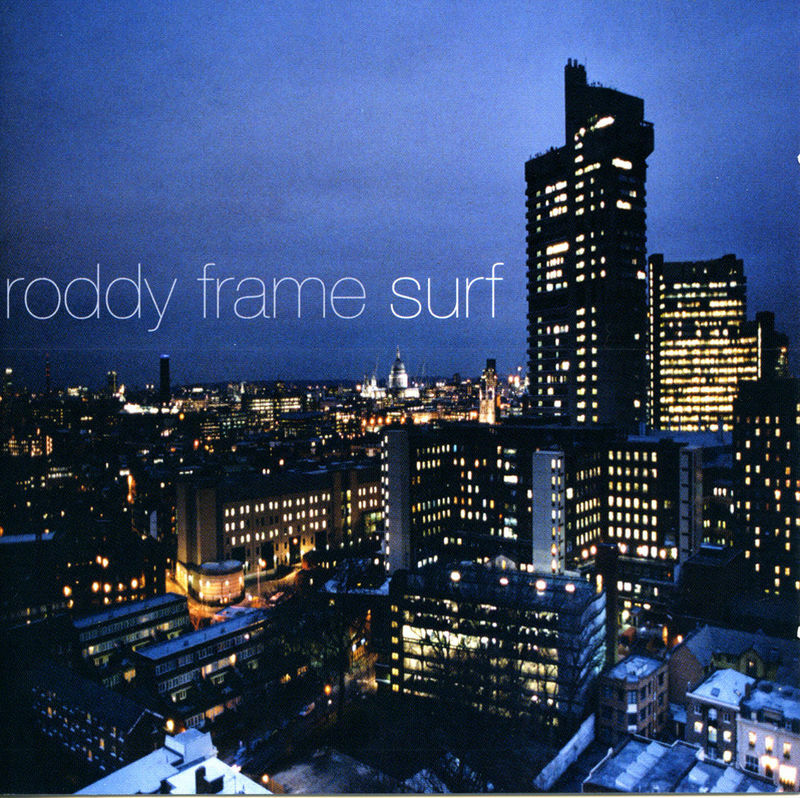 RODDY FRAME claimed the above in a 2002 interview with the Guardian’s Will Hodgkinson prior to the release of Surf, his second solo LP proper. Hodgkinson interviewed the then 38 year- old Frame, best known as the wunderkind behind Aztec Camera, in his Notting Hill flat where he wrote and recorded all the songs on Surf, his masterpiece. Taken from atop Burwash House on Weston Street, London SE1, the cover photograph by Hannah Grace Deller (Frame’s then girlfriend), depicts the London skyline in all its twilight beauty. To my eyes, the picture captures London on a dreary Tuesday night in November. In this photograph, as in Frame’s songs, life is going on in other places: the focus is very much on the switched- on lights in rooms across the city. In the context of the bare instrumentation on the songs collected on Surf- solely voice and acoustic guitar- Deller’s photograph, if anything, feels like a point of view shot from Frame’s mansion- block apartment. Surf opens with ‘Over You’, a finger- picked tune that conveys a rejected lover’s restlessness in the wake of a breakup. As mentioned in relation to the above quote from Frame, the album itself constantly gives a sense that life is continuing in other places across London in spite of the songwriter’s craft of focusing- in on frozen moments in time. No better an example than the line ‘heard you were out, SW3 / talking about how you were over me. Similarly, the song’s final couplet (Me stuck on the strand, trying to get through / And make myself understand that I’ve gotta get over you) provides the perfect starting place for the albums’ succeeding 10 tracks. Surf‘s title track slows down the pace ever so slightly. Arpeggio’d chords and long vowels in the lyrics give a the sense of yearning that Frame’s lyrics convey. Again, however, the focus is very much on London albeit viewing the city, now, through welled- up eyes (The east end squares’ve grown cold and loud / since I lived there with the twilight crowd / The west end lights have lost their wow). Frame captures that sense of alienation in the city, of being a small fish in a huge pond and craving intimacy, beautifully in the chorus of ‘Surf’ (When I was young the radio played songs for me / it saved me). ‘Small World’, best known as the theme tune from hit BBC comedy series Early Doors, ends an opening trio of songs that nail the tone of the record, lifting the mood just slightly. Frame’s peppers Hopper- esque images of night-hawks in London town throughout the lyric and his voice is simply stunning on this song; his effortless falsetto blending beautifully with the verses, sung in lower octaves. Like ‘Tough’, ‘Small World’ was , perhaps, mooted as a possible single. ‘I Can’t Stop Now’ is one of the most important songs on Surf and a song that is at the thematic core of the record. Serving as the breaking point of the tension built up in the record’s opening side, ‘I Can’t Stop Now’ is a good example of Frame’s ability to judge the timing of subtle changes in the dynamics of a song. One of the most cathartic and climactic lines in the song (’til the first tear falls) stands alone from the busy opening verses, giving that line more emphasis and more weight. Similarly, the key change in the final chorus is beautifully timed and renews the tone of the chorus; where the listener heard desolation and sorrow in the previous choruses, the listener now hears a tone of acceptance and defiance in the same chorus, two steps higher. It’s a stroke that only a singer and a songwriter of Frame’s talent and experience could pull off. Throughout Surf, Frame wears his influences lightly, though obvious exceptions are…well, obvious. Paul Simon looms large on Surf. On ‘Abloom’, which also has qualities in the chord patterns and the finger- picking that recall Nick Drake, there is a hypnotic quality in the rhythm and harmony; there is a jazz-y feel to it. Simon, however, is also there in ‘High Class Music’, the title of which also carries Simon’s influence in its sardonic use of demotic language. The opening finger- picked phrases of each verse immediately recall Simon’s ‘The Boxer’. Add in a fast- paced abab rhyme scheme and Paul Simon’s influence in Frame’s writing is undeniable. Furthermore, Simon is there again in ‘Mixed Up Love’, one of the stand- outs from Surf; the descending scale of the verse is quite similar to the intro to Simon’s ‘America’. ‘Mixed Up Love’ encapsulates everything that Frame claims about “…being 38 and wondering what you’re going to do next.” in his Guardian interview. The end of the chorus, just as in ‘I Can’t Stop N0w’, contains a wonderfully placed spoken line at the chorus’ end: you’d think that I’d know better now. Finishing on ‘For What It Was’, Frame exudes the kind of simplicity and concise song-writing only found in country music. There’s a soulful, gospel quality to ‘For What It Was’, rich with spiritual imagery and Frame’s own confident, wry voice (And if the prophets knocked my door with all that heaven held in store, / I’d probably ask to see a sample). Not since Paul Simon’s Hearts and Bones nor Bruce Springsteen’s Tunnel of Love has there been an album by a singer- songwriter that has explored themes of love, heartbreak and identity as skilfully and masterfully as Roddy Frame has on Surf. It is hard to think of an LP from the last 10 – 15 years that is so masterfully crafted, so fully realised, so enviably achieved. So has Surf been unfairly overlooked? Of course it has, though it’s easy to see why. In 2002, the music press was still feverishly high over the so- called new rock revolution, of which only Jack White emerged as a true, world-class, all time talent. The Strokes burned themselves out, the less said about the also- rans the better. Coldplay, too, had just launched A Rush of Blood to the Head, their best record to date, which took them directly into the big leagues. Combined, Chris Martin and Co.’s world- beating aspirations and the distortion- heavy sounds from New York, LA and Detroit drowned out the fragile, modest tones of Frame’s Surf. If it was Frame’s ambition to freeze 11 moments from London’s bustling, restless and constant metropolis, he succeeded admirably, capturing that sense of heartbreak, of loneliness and relentless self- examination like few songwriters before him. Surf is, quite simply, one of the most moving, spellbinding and memorable collection of songs I have heard in recent years. SO I’m going to start uploading some new, regular features to run along my published work. Every weekend, I’ll post up The Saturday Song and The Sunday Poem on their respective days. These features will consist of a detailed, critical analysis of a song and poem, applying music theory and literary theory / poetic terminology to the song / poem in question, though done so- I hope- in a way that is entertaining, at the very least. Every song that I feature will have either a Soundcloud or Spotify link embedded in the feature. For copyright reasons, it won’t be possible to post an entire poem on the site, though I will encourage readers to dig out the poem in their libraries and, indeed, from their own bookshelves. Certainly, I will list the collections and anthologies in which the chosen poem is published. Another feature that I am toying with is The Friday Film, which would be written in the same tone as The Saturday Songs and The Sunday Poem. The Friday Film, however, is a longer term idea that I may develop, depending on the success of the The Saturday Song and The Sunday Poem. This week’s Saturday Song will be Vampire Weekend’s Obvious Bicycle. This week’s Sunday Poem will be Simon Armitage’s The Shout. If there are songs and / or poems that you would like to see covered, please comment below with your suggestions. Originally featured in both the print and online editions of The Irish Post on Wednesday February 13th, 2013. In what might be considered a public display of bromance, my brother Steve and I have compiled a list of Alternative Irish songs for Valentine’s Day. The entire playlist is available on Spotify. Hard as it is to pick favorites, I’ve posted two of them below.